You may have seen recent headlines circulating about a wedding in West Linn, Oregon offering an open Weed Bar(!) to guests. 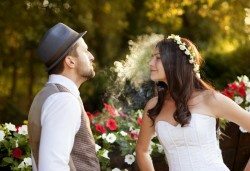 Because legalization just took effect in Oregon on July 1, the idea of providing marijuana to wedding guests is still very new, but I believe cannabis-friendly weddings will inevitably become the new norm for modern nuptials. I believe this for a lot of reasons, but the main reason is simply because many people enjoy using marijuana in social settings. We will only see cannabis bars at more and more weddings and other social events as marijuana becomes more mainstream in Oregon and across the country. The legalization of pot in Oregon has couples considering weed bars at their weddings. And right there is a perfect example of the power of exposure. The main reason I felt the need to come out of the cannabis closet was to expose people to the truth about cannabis and its positive effects. I was a local news anchor who was fired for using marijuana in my personal time, and my story really shook some people’s perception of me. Rather than changing their positive opinion of me, I thought sharing my story could help change people’s negative opinion of cannabis consumers. So far, I’ve been right. The growing trend of “Cannabars” at wedding will expose more people to responsible adult cannabis use. This trend will hasten the acceptance of marijuana use. Imagine showing up at your cousin Brenda’s wedding and lighting up a joint for the first time with Aunt Sally! Aunt Sally could change her mind about marijuana and then go back to her friends in rural Oregon and tell them about her positive experience with cannabis. Maybe those friends each tell a couple people, and soon Aunt Sally’s small town is a little more open-minded to legal marijuana. Another major positive to having weed at weddings? Consuming cannabis is safer than consuming alcohol. Whether it’s a full-on open bar with hard liquor or just champagne for one toast – it’s almost expected to provide your wedding guests with some form of alcoholic beverage. Knowing the dangers of alcohol, why not provide a safer alternative? They are your loved ones after all. Wouldn’t you rather them consume cannabis, something that causes less harm, is less addictive, and can’t kill them? With the facts the way they are, I don’t think it will take very long for more people to see the benefits of providing guests with marijuana. If you’re within the law, consider having a weed tent at your next big event! You might be surprised who enjoys it, and more importantly, those who enjoy it might even surprise themselves. Cyd Maurer was a news anchor for KEZI Channel 9 in Eugene, Oregon. A graduate of the University of Oregon, Maurer was a rising star at the station until she was unjustly fired for her personal marijuana use. Her co-workers and staff had only good things to say about Ms. Maurer, but she was the victim of an outdated, unscientific corporate policy. KEZI's loss is the cannabis community's gain as Ms. Maurer is now dedicated to improving marijuana laws and policies. By coming out of the cannabis closet herself, Cyd hopes to continue to end the stigma surrounding marijuana use and bring more freedom and equality to the cannabis community.